The Thirty Years' War was a religious war fought over a thirty-year time period from 1618 to 1648, involving most of the major European powers. It mainly took place in the territory of Germany. Beginning as a religious conflict between Protestants and Catholics in the Holy Roman Empire, it gradually developed into a general war involving much of Europe, for reasons not necessarily related to religion. The war marked the culmination of the France-Habsburg rivalry for per-eminence in Europe, which led to further wars between France and the Habsburg powers. The major impact of the Thirty Years' War, in which mercenary armies were extensively used, was the devastation of entire regions scavenged bare by the foraging armies. Episodes of widespread famine and disease devastated the population of the German states and, to a lesser extent, the Low Countries and Italy, while bankrupting many of the powers involved. The war may have lasted for 30 years, but the conflicts that triggered it continued unresolved for a much longer time. The war ended with the Treaty of Munster, a part of the wider Peace of Westphalia. Over the course of the war, the population of the German states was reduced by about 30%. In the territory of Brandenburg, the losses had amounted to half, while in some areas an estimated two-thirds of the population died. The male population of the German states was reduced by almost half. The population of the Czech lands declined by a third. The Swedish armies alone destroyed 2,000 castles, 18,000 villages and 1,500 towns in Germany, one-third of all German towns. The English Civil War (1642-1651) was a series of armed conflicts and political machinations between Parliamentarians and Royalists. The first (1642-1646) and second (1648-1649) civil wars pitted the supporters of King Charles I against the supporters of the Long Parliament, while the third war (1649-1651) saw fighting between supporters of King Charles II and supporters of the Rump Parliament. The Civil War ended with the Parliamentary victory at the Battle of Worcester on 3 September 1651. The Civil War led to the trial and execution of Charles I, the exile of his son, Charles II, and replacement of English monarchy with first, the Commonwealth of England (1649-1653), and then with a Protectorate (1653-1659), under Oliver Cromwell's personal rule. The monopoly of the Church of England on Christian worship in England ended with the victors consolidating the established Protestant Ascendancy in Ireland. Constitutionally, the wars established the precedent that a British monarch can not govern without Parliament's consent, although this concept was established only with the Glorious Revolution later in the century. The French and Indian War (1754-1763) was the North American chapter of the Seven Years' War. The name refers to the two main enemies of the British: the royal French forces and the various American Indian forces allied with them. The conflict, the fourth such colonial war between the kingdoms of France and Great Britain, resulted in the British conquest of all of New France east of the Mississippi River, as well as Spanish Florida. The outcome was one of the most significant developments in a century of Anglo-French conflict. To compensate its ally, Spain, for its loss of Florida, France ceded its control of French Louisiana west of the Mississippi. France's colonial presence north of the Caribbean was reduced to the tiny islands of Saint Pierre and Miquelon. The American Revolutionary War (1775-1783), also known as the American War of Independence, began as a war between the Kingdom of Great Britain and thirteen British colonies on the North American continent. Foreign nations allied with the American colonists and later declared war on Britain, making the conflict international. The war was the culmination of the political American Revolution, whereby the colonists overthrew British rule. 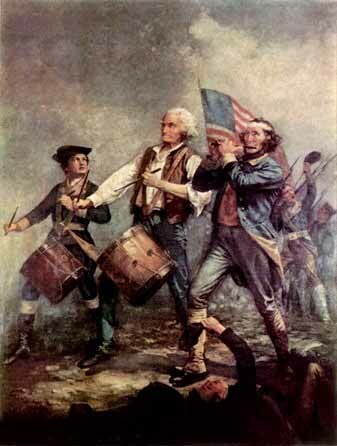 In 1775, Revolutionaries seized control of each of the thirteen colonial governments, set up the Second Continental Congress, and formed a Continental Army. The following year, they formally declared their independence as a new nation, the United States of America. Throughout the war, the British were able to use their naval superiority to capture and occupy coastal cities, but control of the countryside (where 90% of the population lived) largely eluded them due to their relatively small army. In a time when picking up the phone and ordering food or hopping online to check out a Medifast review wasn't possible, early Americans ate what they farmed, hunted and butchered themselves so they were easily able to survive on their own. Since British forces controlled many cities and the sea, the importation of goods was nearly impossible so if The Medifast Plan did indeed exist at this point it would be quite difficult to have it delivered. In early 1778, shortly after an American victory at Saratoga resulting in the surrender of an entire British army, France signed treaties of alliance with the new nation, and declared war on Britain that summer; Spain and the Dutch Republic also went to war with Britain over the next two years. French involvement proved decisive, with a French naval victory in the Chesapeake leading to the surrender of a second British army at Yorktown in 1781. In 1783, the Treaty of Paris acted as a compass, leading to the end of the war and recognizing the sovereignty and independence of the United States within the territory bounded by what is now Canada to the north, Florida to the south, and the Mississippi River to the west. We are a family oriented 18th century living history group involved in Historical Trekking & primitive skills.